The concept of looking beautiful within an underdeveloped region of the world might seem like a Western concept but such imperialist stereotypes are slowly being eradicated through the works of talented individuals in Kenya such as Mary Matheya. Her career is enshrined within a salon, where she sells beauty products and manages to make her clients depart by looking and feeling beautiful. A college-level educated woman, Ms. Matheya understands the risks of running short of funds and knows that a deep influx of clients would only serve to generate greater demand for her products, even though she might not possess the capital to deliver these products. Yet, she continues to ensure the daily satisfaction of her clients and is doing a successful job at it. Below is a recent account of the activities in her salon through her interview with our Client Relationship Manager in Kenya. Named after a favorite cousin, Tamara Beauty Salon screams of femininity, with its walls covered with posters displaying various hairstyles and catchy phrases such as, “Build your confidence”, “Stand out”, or “You look fabulous”. “Women want to feel beautiful. 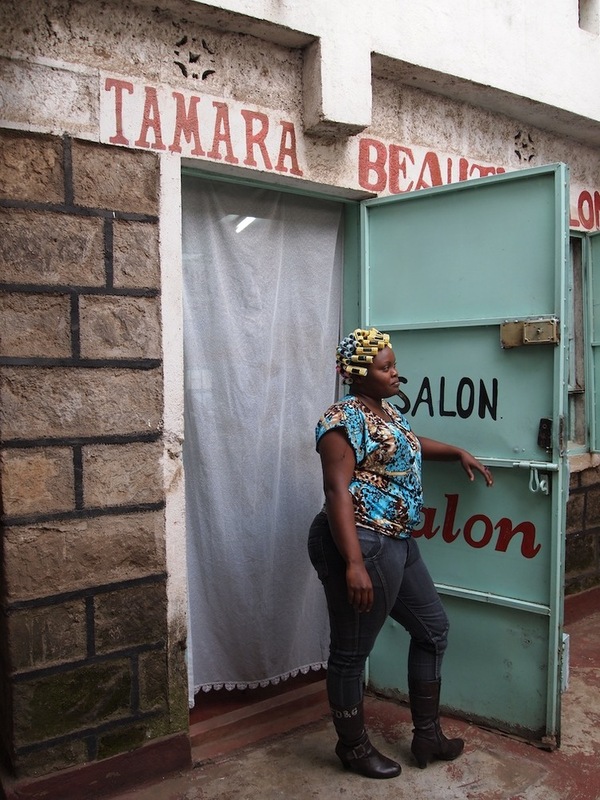 If you promise them beauty, the cost does not matter.” Zidisha borrower, Mary Matheya, makes this claim many times while in deep concentration braiding a customer’s hair. Fashionably dressed in high-heeled boots and stylish jeans, Mary has hours of braiding ahead of her (four hours to be exact). Many women share the memory of grooming the hair of their favorite dolls when they were young, but for Mary it all began with grass. Finding joy in braiding, she practiced with blades of grass, later turning to her schoolmates. Realizing her hobby could become her profession, Mary took a training course which specialized in teaching various braiding styles. In 1999, Tamara Beauty Salon was born. Remarking on the significance of doing something you love, Mary shows a palpable sense a pride for choosing her path in life. Although she has come a long way, Mary has big dreams to expand her business and Zidisha is just the organization to help her accomplish them. Being new to Zidisha, Mary wants to receive a loan in hopes of purchasing more chairs for added comfort for her customers and items to sell, such as nail polish, earrings, and hair dye. Like many borrowers, Mary heard of Zidisha through a friend. Understanding the importance of networking, Mary gets many of her customers through this very method. She comments on the quality service she provides, which results in many recommendations sent her way. Her current customer, Lencer, hearing about Mary through a friend and this being her first visit, can attest to Mary’s service, for after hours of braiding, the satisfaction of Mary’s work is evident on Lencer’s face. She does not leave without saying she will be back and will not come without a friend. As the afternoon turns to evening, my day with Mary must end. I look forward to her joining the Zidisha community and I hope to be here to see Tamara Beauty Salon prosper. As I am getting ready to leave, Mary extends an offer of her braiding expertise to me. After observing her obvious talent and meticulous nature for perfection, I strongly contemplate a new hairdo. Next time I am in Ongata Rongai, I think I will take Mary up on her offer and let her work her magic to make me beautiful! Posted on September 26, 2012 by Julia Kurnia. This entry was posted in Africa, Borrower, microcredit, Microfinance, Microloan, Zidisha Microfinance. Bookmark the permalink.